The code used for hello world script is available as a gist. Reading time: < 1 minute Python logging library is really flexible and powerful but usually, you need some time for setting up the basics or just for logging in a simple script, some commands and settings have to be done. 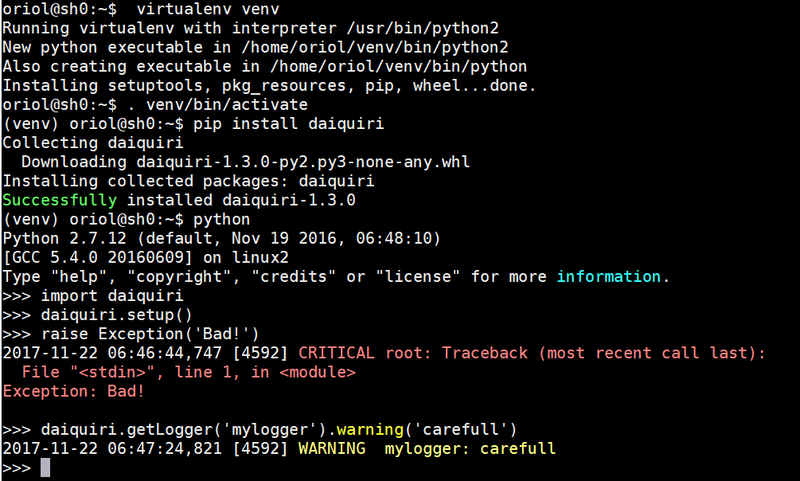 Daiquiri is a library which wrapper python logging library and offers a simple interface for start enjoying logging features in python. Next, there is a hello world example extracted from Daiquiri documentation which shows how easy it gets nice output from the console when you're programming simple scripts. This week I finished this course from MIT. After my previous experience on MIT professional courses, I decided to involved in a new one. 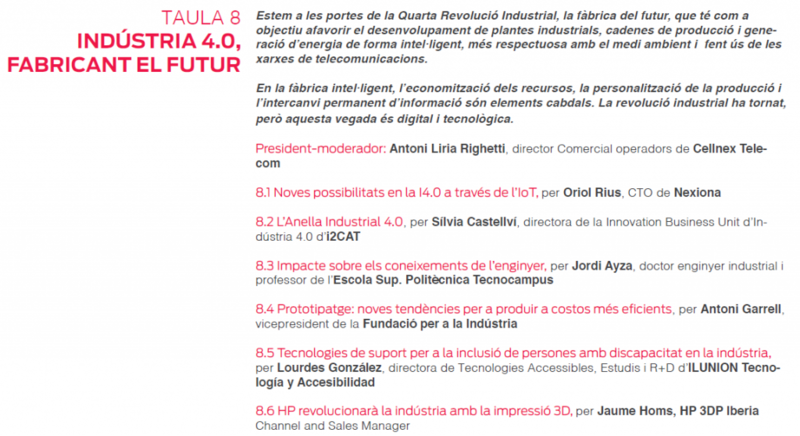 I know it sounds strange after my really bad feedback in my previous course about IoT, but I decided to give a second opportunity to this kind of courses. My general opinion about this course is by far better than the previous one, so I’m happy to be done this course. I learn a lot, and of course now is time to put knowledge in practice, so it’s not a minor thing to do. Talking about the difficulty of the course I found two initial modules especially difficult, a lot of mathematics and formulas and it was very difficult to follow explanations because of the complexity of the concepts and mathematical formulas which describe them. In my case some code in any programming language using libraries which abstract mathematical formula complexity would be ideal. About those two initial modules: “Making sense of unstructured data” and “Regression and Prediction” perhaps the subjects sounds good especially where I want to apply the knowledge, so in IIoT, this is not easy to figure out how to apply that knowledge in time series data. Maybe the best thing that I get from there is what are the main algorithms and theoretical basis that I have to apply in real world projects. The third module has the subject “Classification, Hypothesis and Deep Learning” and it’s very linked with the previous, by the way, I found easier to understand the related mathematics and how to apply that knowledge. I especially found easy to understand and interesting to apply in IIoT the deep learning chapter, some concepts and basic ideas about neuronal networks are described in a very easy way and graphical synoptic and animations help a lot on following the concepts. The last two modules about “Recommendation systems” and “Networks and Graphical Models” are presented in a very useful way, very applied to real world and with a lot of examples and I appreciate it. Apart from that teachers did a very good work explaining together and being very progressive in complexity from the bottom up. If I have to suggest any improvement would be in the practical part, I consider Python a programming language with better future in Data Scientist world than R, may be R has a very good base and history as a language for scientists but I think tools like Jupyter has a better future than legacy tools like RStudio. So get more details and references about how to play with Python based tools and libraries than focus on R would be my recommendation. Another point to improve, in my opinion, would be add some videos dedicated to using tools and how to apply those tools in case studies. At the end of the day, screencast videos are super useful when you’re not familiar with some technologies. Summarizing I recommend the course, but don’t expect any fast application of the knowledge is a very theoretical course to get the basics and later get practical skills from your side with case studies or other references. 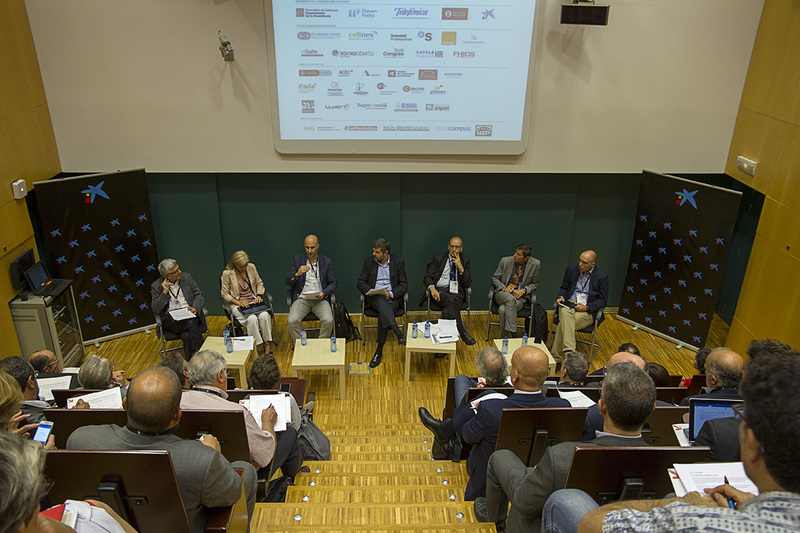 Last Thursday I participated in a round table about Industry 4.0 as part of the Catalan Telecommunications Day, really interesting event in a very nice place. I haven’t been in Cosmo Caixa since it was called “Museu de la Ciència” a very long time ago. But I have to say that the place is very trendy and awesome. Coming back to the event, I met some good friends and it’s always a pleasure but I also meet very interesting new people with who I’ll be happy to keep on talking and going deep on aligning synergies. One of those are i2cat people, guys we have to find the proper way to collaborate because again and again we meet each other with very compatible points of view. Firstly I think we have the debt to leadership the fourth industrial revolution, and catch up all those companies that never did the third revolution no the present. 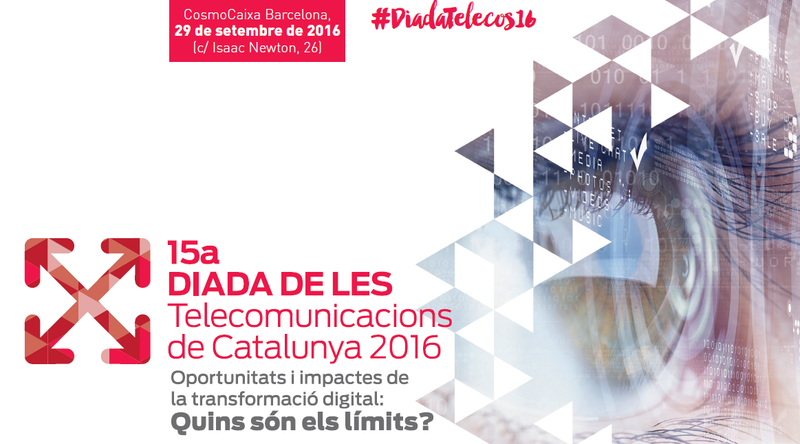 Catalonia has very powerful minds with a lot of entrepreneurs now it’s time to work together and demonstrate what we can do. In the 90s they said that Internet is going to be like another TV channel in our TVs; companies only need to create a Web page and they are ready for the future. But in the end it changed the ‘P’ of product in the marketing strategy. Early 2000 e-commerce get it real and they said that it’s only another distribution channel, but finally it has been the change of two ‘P’s point of sale and price, both of them became obsolete. In 2006 the revolution come through the social networks, they said only this is only personal webs instead of enterprise web; just create some accounts in those social networks and that’s all. But ‘P’ of promotion has been redefined with new market segmentation. Since 2010 smartphones sales increased dramatically and they said this is just like a mini PC, just adapt web pages and everything is done. But a lot of markets disappeared or changed deeply: photo cameras, music CDs, telephony, etc. So ‘P’ of point of sale and ‘P’ of product totally redefined. Virtual and physical experiences unified. First decade of new century Internet 2.0 has been consolidated, they said this is just web where people can participate. Companies only need to add a corner in their webpages where can discuss. ‘P’ of prices digital money and a lot of new business models. Currently we talk about IoT and they say this is about adding electronics to the physical world. 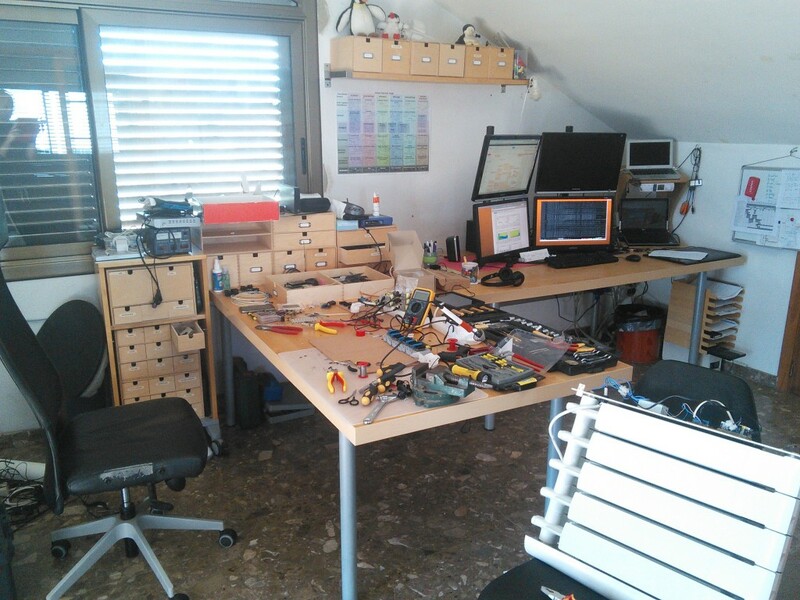 Instead of that what happen is all product in a digital environment tends to be converted in a service. Again the ‘P’ of product is obsolete and has to be totally redefined. Having that in mind IMHO we have huge opportunities within reach. Some times schemas and snippets don’t need large descriptions. If you think this is not enough in this case tell me and I’m going to add explanations. 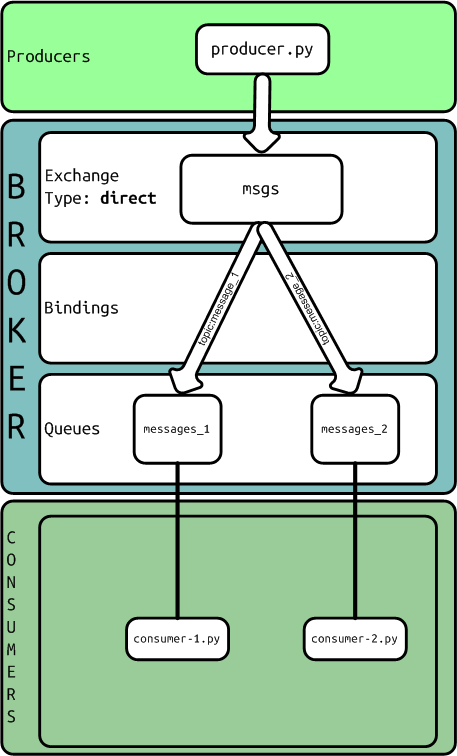 Using a python library called kombu as an abstraction to talk with AMQP broker we are going to develop different message routes setting each type of Exchange. 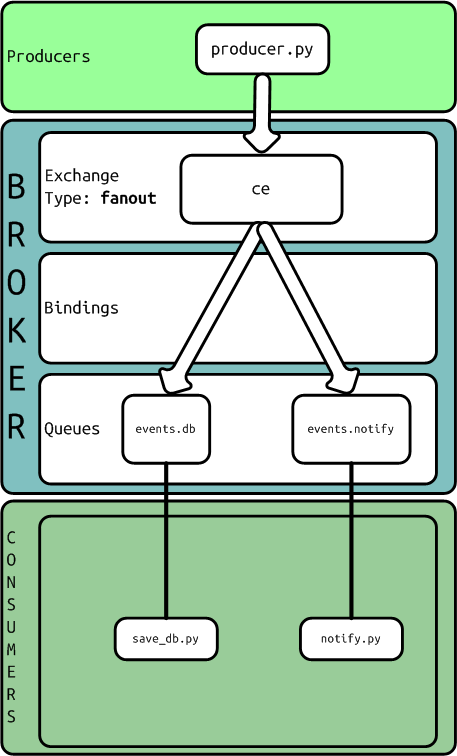 As a backend I used RabbitMQ with default configuration. Kombu implements SimpleQueue and SimpleBuffer as simple solution for queues with exchange of type ‘direct’, with the same exchange name, routing key and queue name. 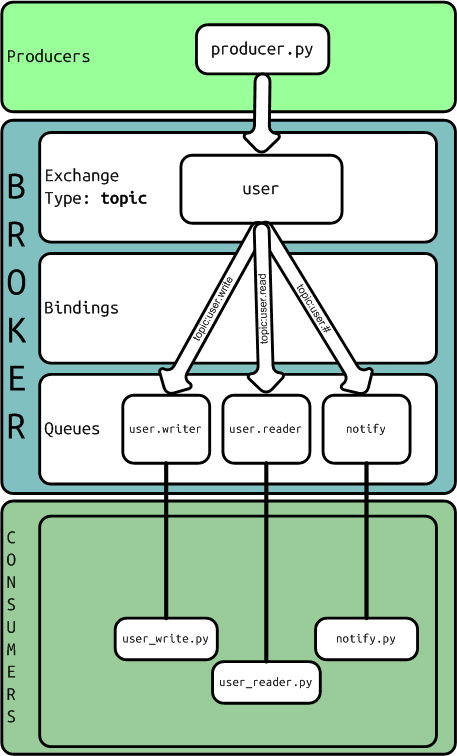 Nowadays last version of browsers support websockets and it’s a good a idea to use them to connect to server a permanent channel and receive push notifications from server. 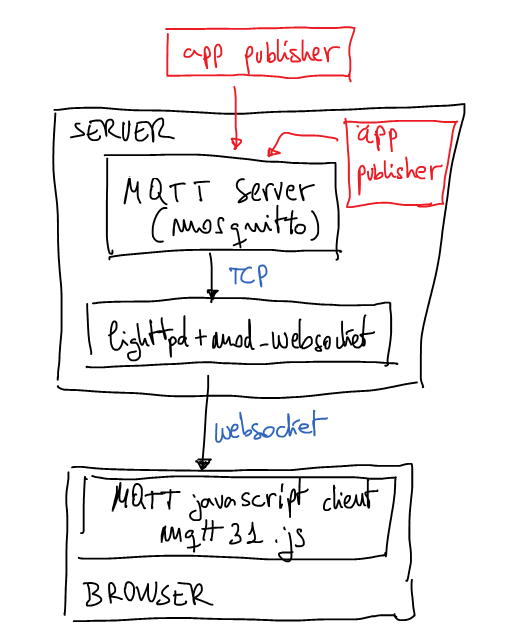 In this case I’m going to use Mosquitto (MQTT) server behind lighttpd with mod_websocket as notifications server. 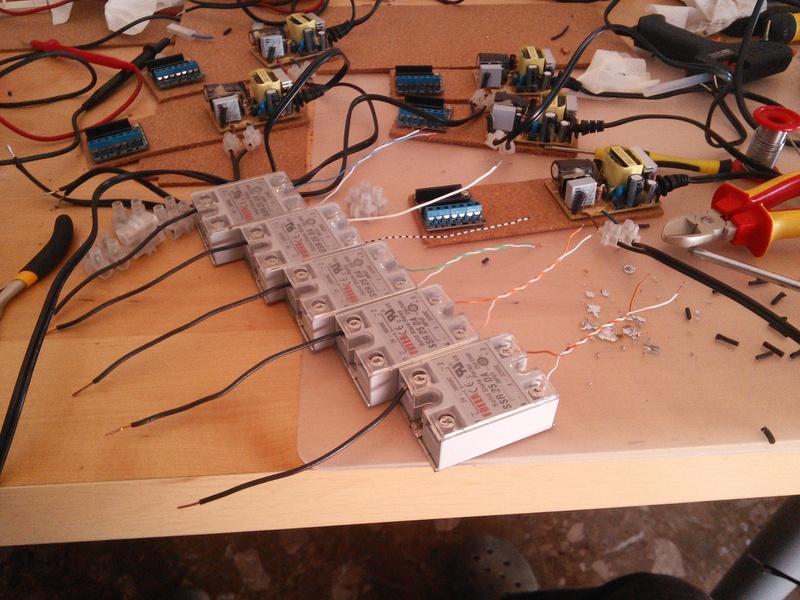 Mosquitto is a lightweight MQTT server programmed in C and very easy to set up. The best advantage to use MQTT is the possibility to create publish/subscriber queues and it’s very useful when you want to have more than one notification channel. As is usual in pub/sub services we can subscribe the client to a well-defined topic or we can use a pattern to subscribe to more than one topic. If you’re not familiarized with MQTT now it’s the best moment to read a little bit about because that interesting protocol. 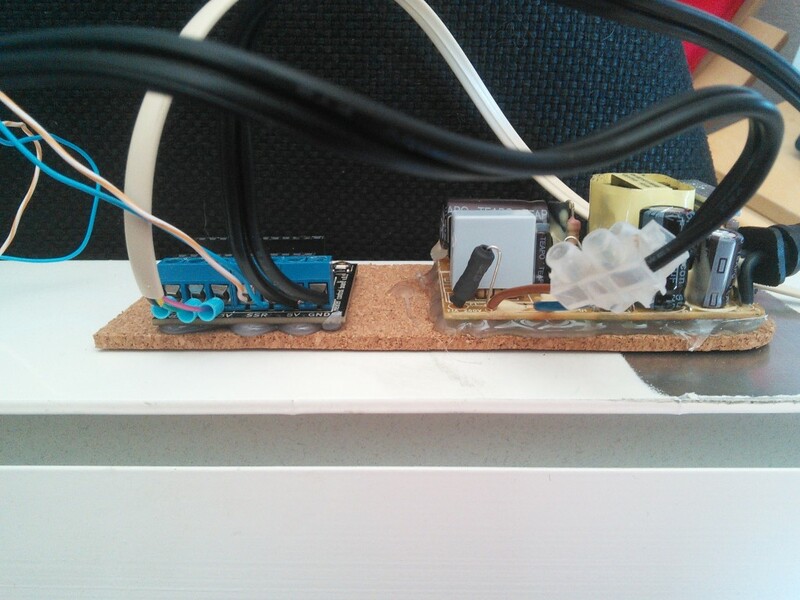 It’s not the purpose of this post to explain MQTT basics. Last part is very simple, the client connects to the server and links some callbacks to defined functions. Pay attention to ‘useSSL’ connect option is used to force SSL connection with the server. As you can imagine this callback will be called when the connections is established, when it happens the client subscribes to all channels called ‘/news/+/sports’, for example, ‘/news/europe/sports/’ or ‘/news/usa/sports/’, etc. We can also use, something like ‘/news/#’ and it will say we want to subscribe to all channels which starts with ‘/news/’. If only want to subscribe to one channel put the full name of the channel on that parameter. Next parameter are dictionary with quality of service which is going to use and links two more callbacks. It’s called when new message is received from the server and in this example, the message is printed in console with log method. 1379873664: Opening ipv4 listen socket on port 1883. 1379873664: Opening ipv6 listen socket on port 1883. You have to see SSL negotiation and then you can try to send HTTP commands, for example: “GET / HTTP/1.0” or something like this. Now the server is ready. Pay attention to server port, it isn’t the ‘https’ port (443/tcp) because now the code is using a real MQTT client. The websocket gateway isn’t needed. 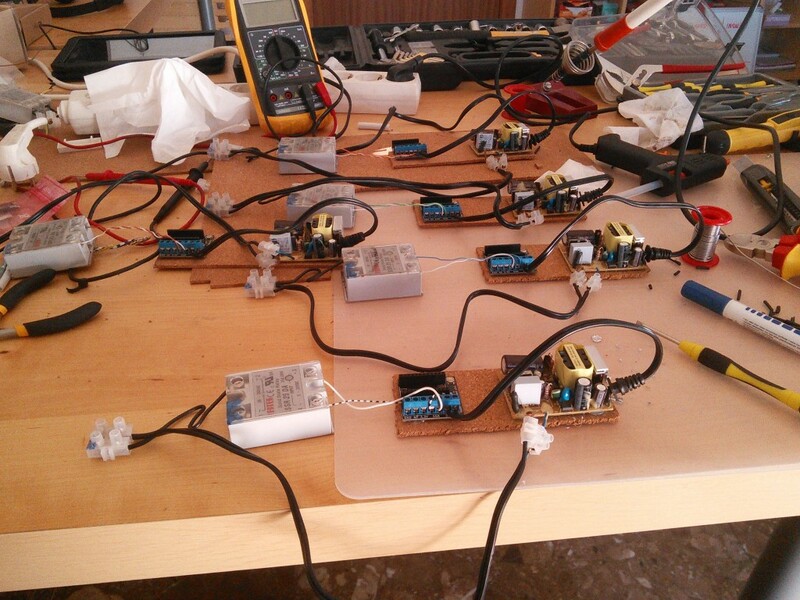 Last weekend I worked on setting up home heaters using Panstamp. 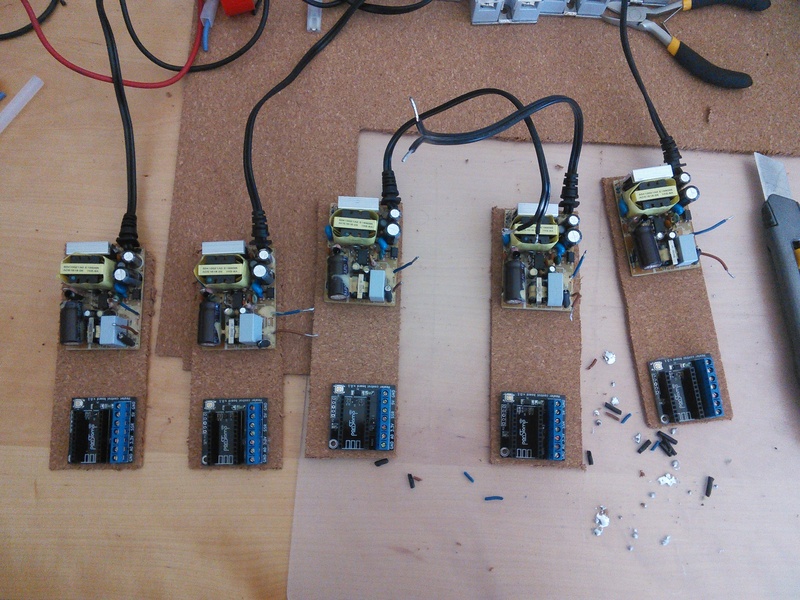 Panstamp is an Arduino board with Texas Instruments radio. 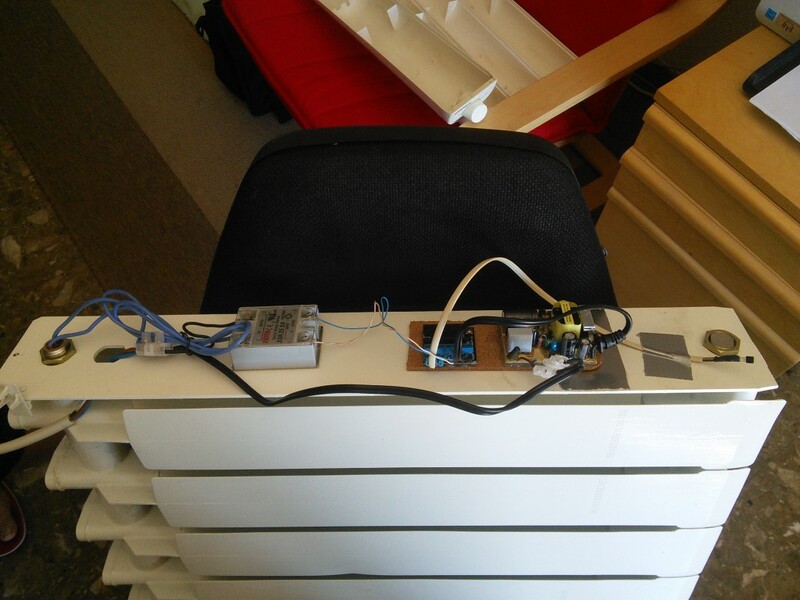 Next winter we’re going to control our home heater using connected internet devices like the laptop, tablet o mobile phones. 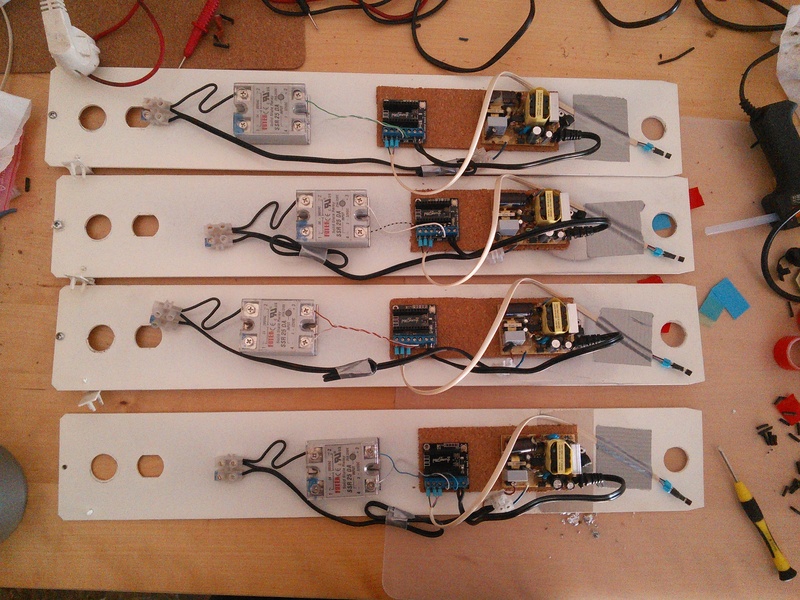 In this post I only want to share some pictures about the process to install the electronics inside the heaters changing the old electronic boards with new custom ones. 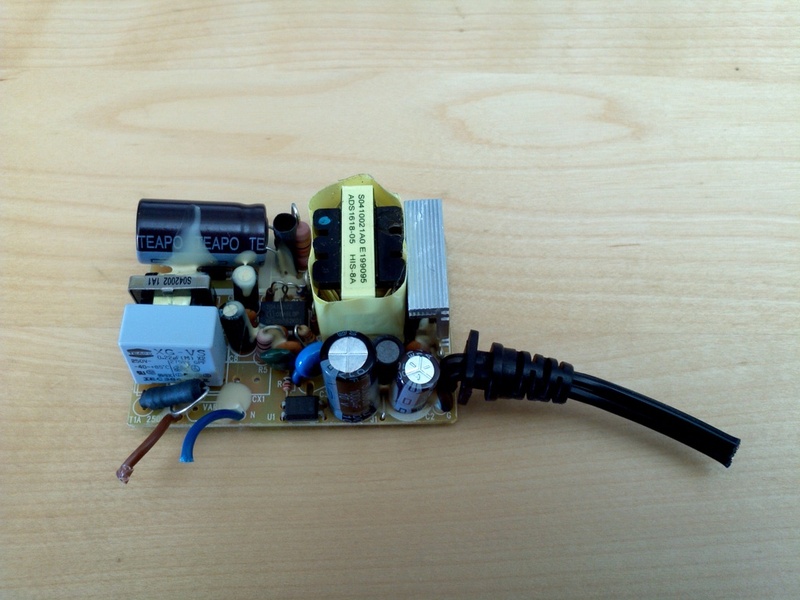 AC/DC transformer, outputs 5V. It’s really cheap, in this case free because I have more than 20 of them from old projects. 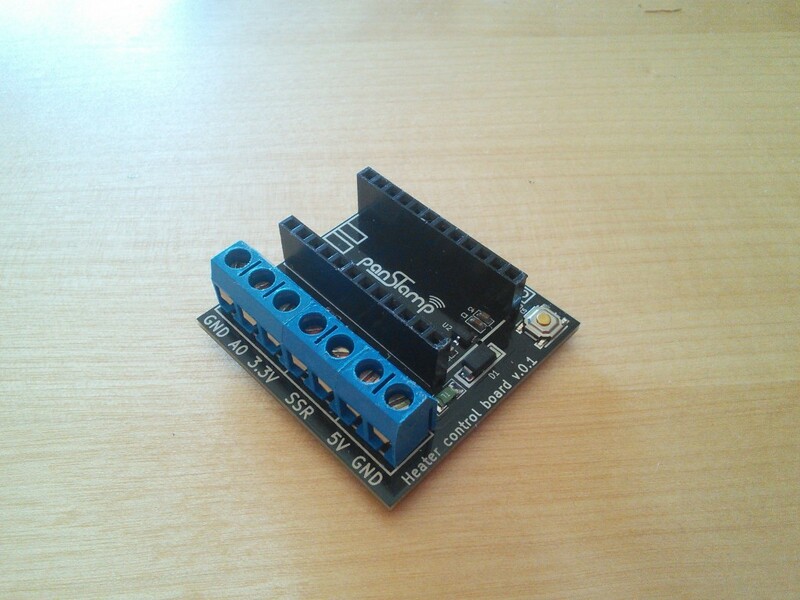 A small custom PCB designed and made by Daniel Berenguer, the owner of Panstamp. Thanks again Daniel. 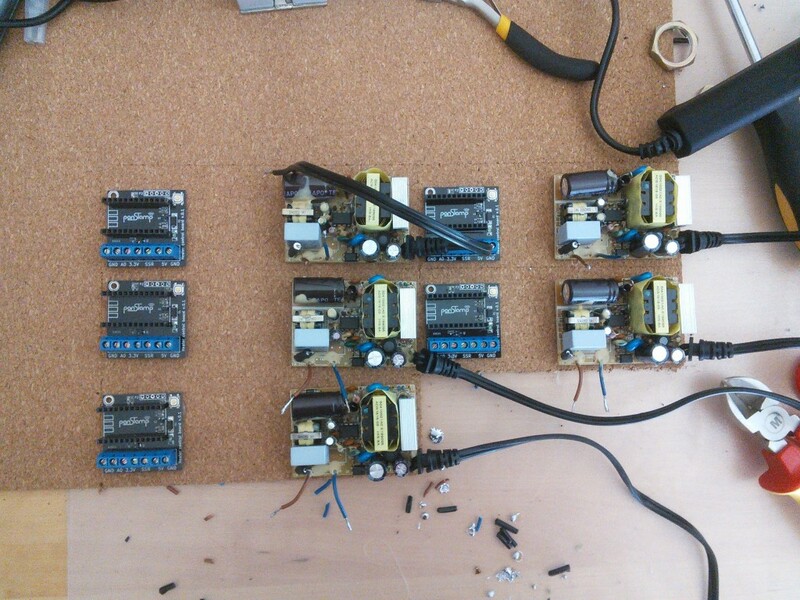 I bought the PCBs and parts for around 10€ each one. 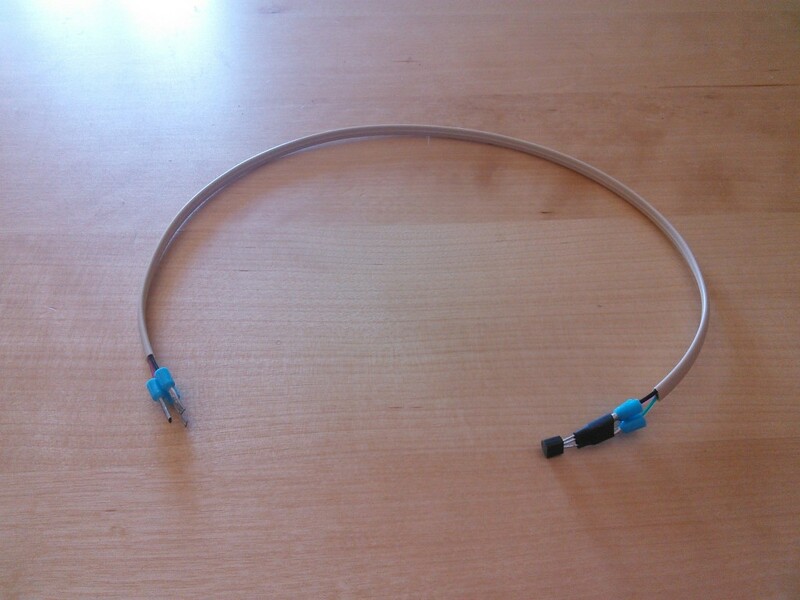 TMP36 temperature sensor. It costs about 1,5€ each one. 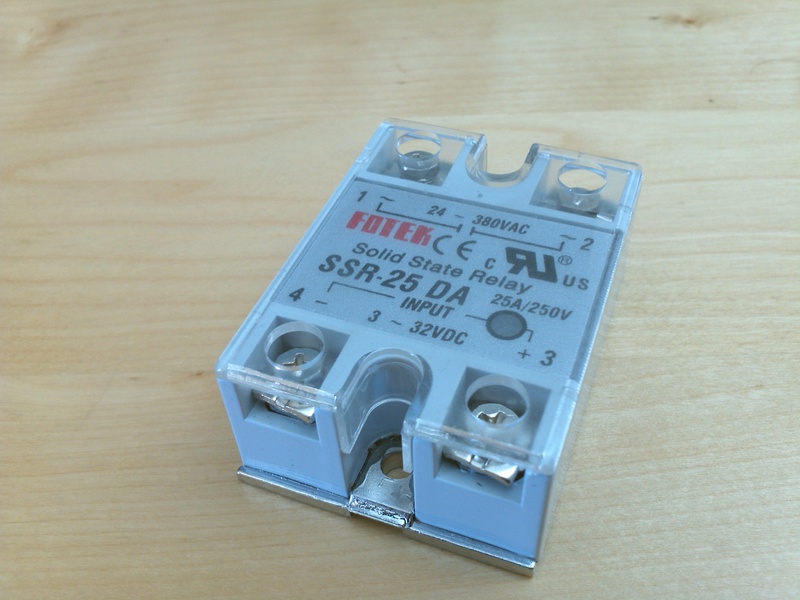 Solid state relay (SSR) bought in Alied Express web site for less than 5€. 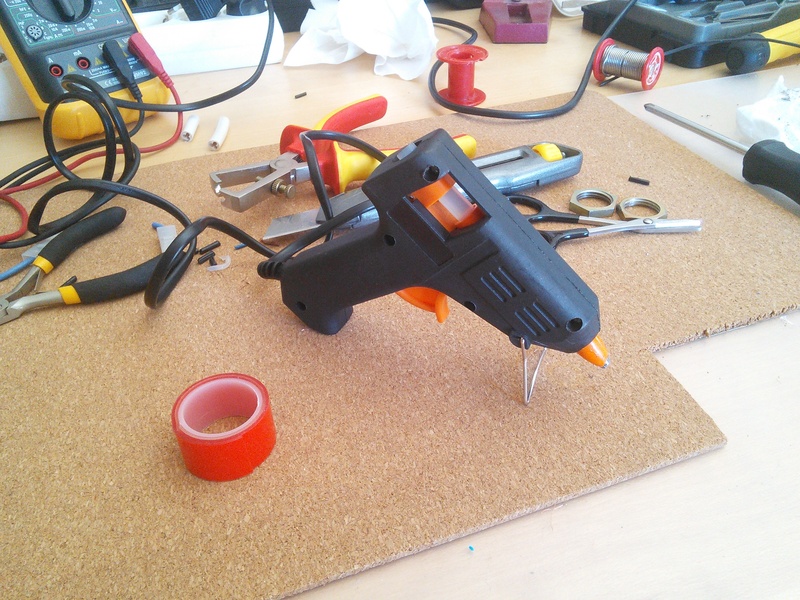 I used a lot of tools, because DIY aren’t my strong hability. Next weeks, I’ll come back with this subject to talk about the software part. Pay attention to ‘redirect_stdouts_to_logger’ it’s used to send all outputs like print’s or something else to syslog. if you want to test it take a look to demo site. 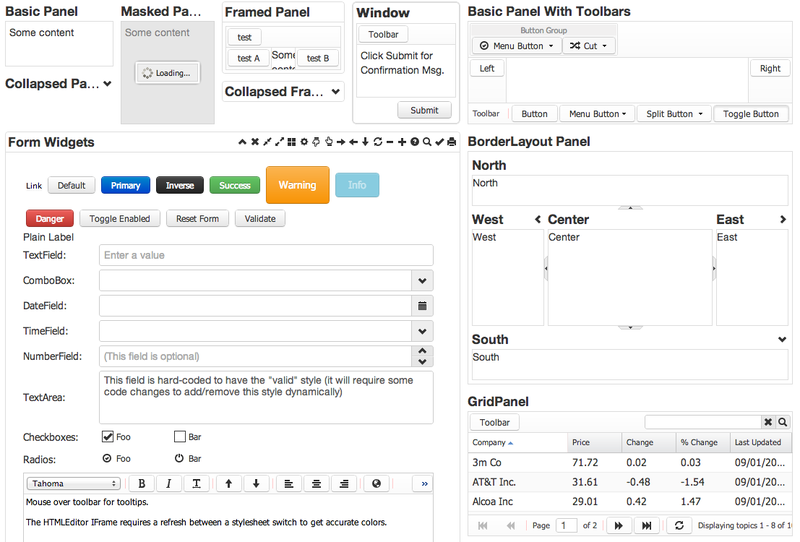 The theme is opensource and you can find the source in github. The second and last one is Clifton theme. IMHO is a nice theme although it’s not really free. It costs around 320€, but in some professional projects it could be a really low price if you consider the effort to get a professional look and feel . 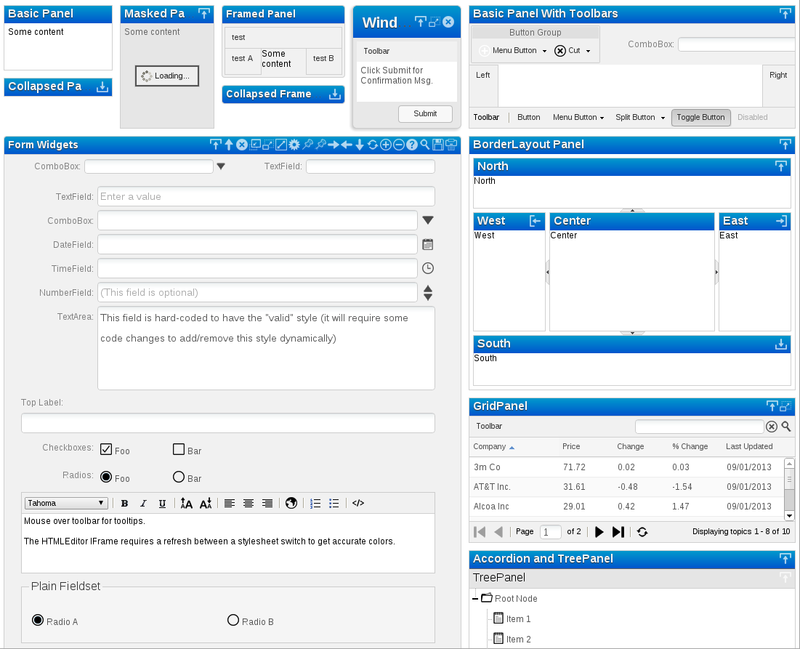 You can try it in demo page.